Obviously at the moment the biggest social networking site out there has to be Facebook, although the big deal with the HTC ChaCha and the soon to be released HTC Status on AT&T is that Facebook button, you can now get Facebook for every phone as Facebook has now launched the Facebook for Every Phone app. And we have an introduction video of Facebook for Every Phone, which comes our way courtesy of the guys over at Daily Mobile and by way of YouTube user Daveyyking and delivers just over two minutes of Ron from mobile Facebook letting everyone know about Facebook for Every Phone. 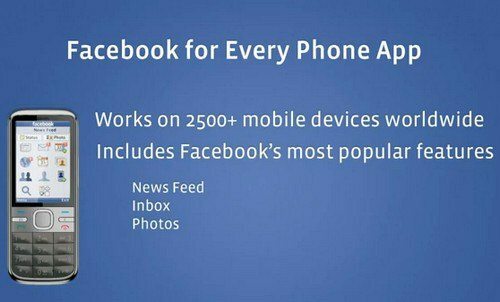 Apparently the Facebook guys wanted people to have a great Facebook experience no matter what mobile phone they carry and thus Facebook for Every Phone work on more than 2500 mobile devices globally and includes Facebook’s most popular features. For those that wish to user the new Facebook for Every Phone application all you need to do is open your mobile browser and hit up m.Facebook.com, log in and scroll right to the bottom where you will find a download link, hit it and the Facebook for Every Phone will download and install. With the Facebook for Every Phone app users can of course upload images right from the app, browse photos and leave a comment, while Facebook news feeds is the simplest way to stay in touch with friends and clicking on a post the user can comment, like, view the posters profile and such. The new Facebook for Every Phone app also makes it easy to update your status or even take a photo directly from the home screen by clicking the photo icon that opens the camera and then point and shoot, and you can edit the photo and upload it directly or even add a caption. So that’s about it all you really need to do now is head on down and mash that play button to check out the introduction to the Facebook for Every Phone app, and of course if you want the app just follow the instructions above, and if you do use the new app feel free to let us know how you get on…enjoy.